I’ll begin with the moral of the story: always look for those secret gems! So everybody knows Ruth’s Chris Steak House. It’s a chain Steak House, not known for it’s presentation, but known for its tasty, though quite expensive, steak. My friend Patrick and I had actually been for steak just weeks before, having bought some coupon online to get $75 for just $50. The steak was delicious, duh, but we’re here to talk about the burger. Well, let’s do a little tangent, first, and amuse bouche of sorts. A lot of people have asked, why is the name “Ruth‘s Chris”? From my understanding, there was a place called Chris Steak House, and a lady named Ruth bought it. She decided to keep the Chris name there, due to the previous popularity of the restaurant, and hence the somewhat ridiculous name. Ah but yes, the burger. So Ruth’s Chris has an extensive bar, like many high-end restaurants. And like the steak, the drinks aren’t cheap. But on the back page of the extensive drinks list, there is a small bar food menu, not advertised, and quite easily overlooked. There’s a steak sandwich, onion rings, and, wouldn’t you know it, a burger! I actually found out about this menu from my cousin, who frequents the establishment for this secret burger. When she told me that it costs just $10, I relayed this information quickly to my friend Patrick, and we now had a great use for the remaining balance on our gift card! Score! We were seated in the bar in view of the SF Giants game (always a plus), and were even served the warm bread we’d normally be served ordering steak! Sure enough, for $10, there was a burger, with fries, on the bar menu. I had extremely high hopes, since I figure RC uses pretty good quality meat, right? We also ordered sparkling lemonade. I was shocked to learn that this clearly house-made beverage comes with unlimited refills. This is almost too good to be true. But would the burger hold up? Let me tell you, the burger was delightful. A gigantic patty, cooked with the same precision, to the same precise doneness as one would expect a $40+ steak. And to be honest, at Ruth’s Chris, I’d expect no less. And the burger just keeps going. It’s every bit of 8 oz. of melt-in-your-mouth burger. I made it through half, and already felt full, but then I came to my gustatory sense[s], and promptly wolfed down the rest of it. I’m going to guess it’s closer to 25/75 fat/lean than the standard 20/80, so expect to go all out if you’re eating this dinner. But bite after bite, the patty just keeps melting in your mouth, and you just remain in burger nirvana. And if/when you finally finish it (I won’t judge you if there’s some left! ), you’re ready to sit back in your comfy booth, and bask in the post-burger glow. The fries were plentiful, and nicely seasoned (yeah I had a few before this picture was taken). A nice bonus, considering the price. This is one of those times where I almost want to keep this seemingly well-kept secret for myself, but ultimately I must do my sworn duty as a food blogger, and spill the beans…er…beef. So I hope you’ll take my advice and try this super deal out for yourself. With the sparkling lemonade, tax, and tip, we each spent about $18. But for $10 pretax, this burger is a steal. And I shouldn’t neglect to mention the service. Since Ruth’s Chris is branded as a fine-dining restaurant, the service has to match up. Sometimes this rule isn’t as apparent in the bar area, but in this case, we were treated to top-notch service. Never had to ask for anything refilled, food was served promptly, and we weren’t rushed out when we opted to have another lemonade and watch a bit of the baseball game, having some time to kill before a movie across the street. While I highly recommend you come here for steak, I even more highly recommend you head for the bar, and try the Ruth’s Chris burger. 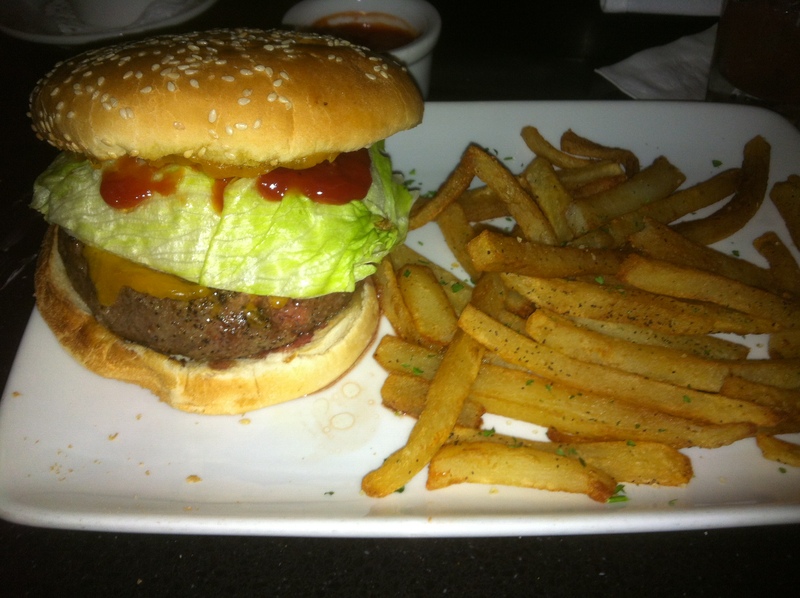 In my top 5 best burgers, as of mid-2012, for sure. We returned to Ruth’s Chris for another burger, and learned that additions of cheese, bacon, grilled onions and grilled mushrooms are completely free. Highway robbery, I tell you.